The Nisshinbo Group’s energy usage amounted to 10.36 million GJ, down 13% year on year. The amount of energy used per unit of sales was 20.24 GJ/million yen, or a 10% decrease. This was due to the transfer of the papers business. Excluding the papers business, energy consumption was up 1% year on year and energy used per unit of sales was down 2%. This was primarily due to increases in energy used for the automobile brakes business and precision instruments business. By type of fuel used, purchased electricity accounted for 75% of the total. Of the total energy used, 16% was represented by coal used at two Indonesian subsidiaries in the textiles business (PT. Nisshinbo Indonesia and PT. Nikawa Textile Industry). The automobile brakes business accounts for the largest portion of energy consumed, followed by the textiles business. The energy conservation impact of new conversion to LED lighting in fiscal 2017 was 2,944 MWh, as indicated in the table below. Nisshinbo Do Brasil Industria Textil LTDA. has been in the process of converting the lighting of its factories to LED lighting since March 2016. 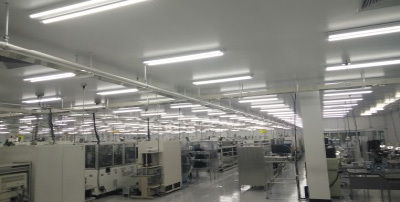 In fiscal 2016, the company converted all 2,187 of the fluorescent lamps in its third factory to LED lighting and in fiscal 2017 converted 2,240 out of 3,336 fluorescent lamps in its first and second factories to LED lighting. The overall amount of electricity saved due to LED conversion is 905 MWh. The company plans to convert the remainder of its fluorescent lamps to LED lighting at the end of 2018. In February 2018, Nisshinbo Brake Inc.’s subsidiary in China, Nisshinbo Saeron (Changshu) Automotive Co., Ltd. (NSC), received a national certification verifying compliance with China’s Cleaner Production Promotion Law. Local government agencies award this certification to companies that produce results through their efforts to conserve energy and resources and to reduce and recycle waste. 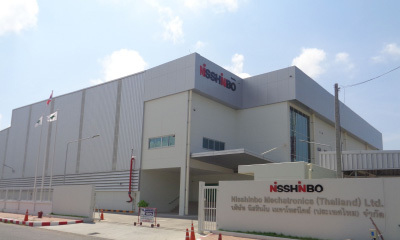 To reduce the company’s environmental burden, Nisshinbo Saeron Automotive has established a reprocessing facility for contaminated water and, by reusing treated water in its factories’ coating processes, has reduced its use of water per day by 12 tons. Additionally, the company has converted its interior and exterior lighting to LED lighting, achieving yearly electricity savings of 35 MWh. The Suzhou Environmental Protection Bureau presented the company with the certification in recognition of these achievements. In 2017, Saeron Automotive Corporation (SAC) applied to become a supported enterprise under the Energy Storage System (ESS), an energy fusion system promoted by the Korean government. The company was acknowledged as a supported enterprise and, in November 2017, installed an electricity storage system in its transformer room. By charging during the nighttime, when fees for electricity are lower and using that electricity during the daytime, SAC has reduced demand for, and cost of, electricity. 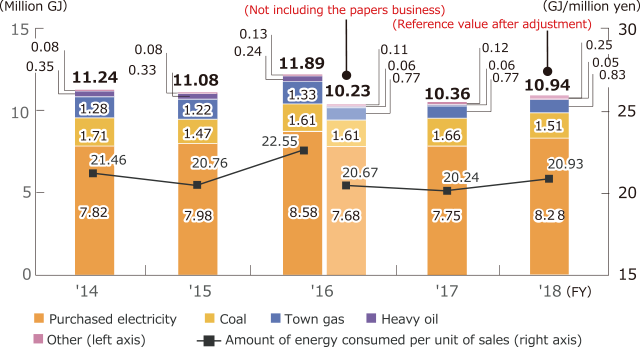 In March 2018, the company reduced electricity fees by about 14.8 million won. Roughly 200 companies applied to for support from ESS but only 15 of them were selected for reception. Additionally, SAC was selected as an excellent example among supported enterprises and was introduced in a Korea Energy Agency brochure. Nanbu Plastics Co., Ltd.’s Oigawa Plant converted the cutting machine in its extruder from a chipsaw (circular saw) type to a knife (circular knife) type. A chipsaw is typically used when cutting molded material to a fixed length during extrusion molding. However, the thickness of a chipsaw’s blades causes the material to chip and produce waste, which makes the joint use of a dust collector necessary. 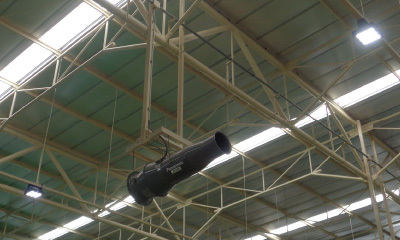 The new knife-type cutting machine doesn’t cause chipping so a dust collector does not need to be used, saving 15 MWh in electricity per year. Additionally, the company saves on resources by not producing waste from chipping and can eliminate air blowing and deburring processes. 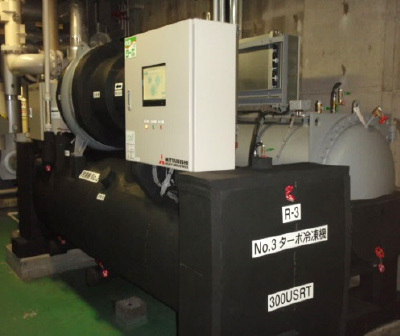 In September 2017, Nisshinbo Chemical Inc.’s Chiba Plant installed an energy-saving air conditioning system. This system monitors the operational status of air conditioners and meticulously controls them, lowering the amount of electricity used. The system also monitors and curtails the rise of electric power demand; when estimated levels of demand approach target levels, it temporarily restrains the air conditioners’ operations. With this system, the Chiba Plant lowered the cost of its electricity demand contract and saved 42 MWh of electricity in fiscal 2017. THAI NJR CO., LTD. maintains four coolant water pumps and had been operating three of them at once but three of them supplied too much coolant water and two of them did not supply enough. In response to this issue, the company converted its pumps not in use to inverter control pumps and optimized working pressure. With this change, the company became able to use only two pumps and saved 173 MWh of electricity in fiscal 2017. The Nisshinbo Group will continue to work toward reducing environmental burdens created at its sites in Japan and other countries moving forward.